Here at the Exmouth Cape Holiday Park we are committed to making your visit as relaxing or as active as you want it to be. We have a wide range of accommodation to suit all travellers, and we feel that with all of our local expertise, we can offer you the chance to see and explore some of the most rugged and beautiful areas in the Pilbara/Gascoyne district of Western Australia. With great weather and fantastic outdoor activities its an ideal location for your next holiday. The Exmouth Cape Holiday Park offers Cabin accommodation, dorms, doubles, Powered sites, ensuite sites, and camping facilities. 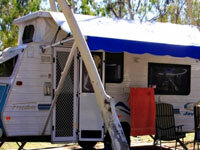 We are only minutes away from the beach or the town and our backpackers are accommodated in air-conditioned cabins. SWIMMING POOL, PLAYGROUND, CAMP KITCHEN, VOLLEYBALL COURT, IN-HOUSE DIVE SHOP, TOUR INFORMATION. Located on the right side of Murat Road as you drive into town. This self contained studio sleeps two people and is a perfect option for couples. Enjoy this private sanctuary with a spacious separate bedroom containg a queen bed. This studio has many great in-room facilities, including a kitchen with a cook top, microwave and full sized fridge, reverse cycle airconditioning, private bathroom and a TV and DVD player for a comfortable stay.This studio is placed near great in park facilities, such as the swimming pool and has its own private verandah, making the perfect option for a romantic holiday getaway. This self contained cabin with free standing private ensuite sleeps up to 6 people and is a great option for a family on a budget. Enjoy this comfortable cabin, with a double bed and two sets of bunk beds. This cabin has many great in-room facilities, including a kitchen with a cook top, microwave and full sized fridge, reverse cycle airconditioning and a TV for an enjoyable stay. These cabins are located near the many in-park faciltiies, such as the swimming pool and also has its own outdoor setting. 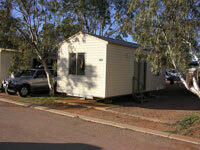 This self contained unit sleeps up to 5 people and is an excellent option for an affordable family holiday. Enjoy the privacy of two separate bedrooms, with a queen bed in the main bedroom and a a double bed with a single bunk over head. This unit has many in-room facilities including a kitchen with a cook top, microwave and full sized fridge, reverse cycle airconditioning, private bathroom and a TV and DVD player for a comfortable stay. 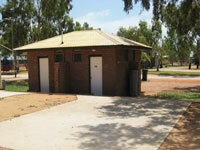 This unit is placed near other great in park facilities, such as the swimming pool and has its own private verandah. This self contained cabin with free standing private ensuite sleeps up to 4 people and is a great option for a family on a budget or a group of friends. Enjoy this comfortable cabin, with two seperate bedrooms with double beds in each room. This cabin has many great in-room facilities, including a kitchen with a cook top, microwave and full sized fridge, reverse cycle airconditioning and a TV for an enjoyable stay. These cabins are located near the many in-park faciltiies, such as the swimming pool and also has its own outdoor setting.Cabin with external ensuite bathroom. This cabin has�2 separate bedrooms with�a double bed in each room�with all linen supplied, sleeping 4. Other amenities include a TV; cook�top, microwave, full sized fridge and reverse cycle air-conditioning. These cabins have a wonderful outdoor setting perfect for the family. Air-conditioned, queen bed motel room with private ensuite. Tea & coffee making facilities, toaster and bar fridge. 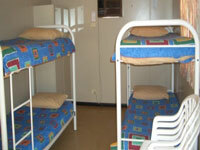 NB: The Motel Rooms are situated in the Backpackers area and are located near dormitories. This area can be noisy with late comings and goings. Please consider this when booking. The queen rooms are air-conditioned with a queen bed. All linen is provided and the rooms are serviced regularly. Shared bathroom facilities. Access to all of the parks facilities including swimming pool, camp kitchen, outdoor cinema and beach volleyball court. Queen Room sleeps 2. 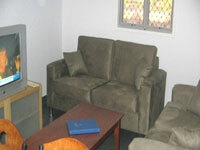 The twin rooms are air-conditioned with two single beds. All linen is provided and the rooms are serviced regularly. Shared bathroom facilities. Access to all of the parks facilities including swimming pool, camp kitchen, outdoor cinema and beach volleyball court. Twin Room sleeps 2. This is a paved powered site with ensuite (Private Toilet & Shower) A refundable $20 key deposit is required for the use of the ensuite. Campers kitchen available. Children are classed between 4-15yrs. 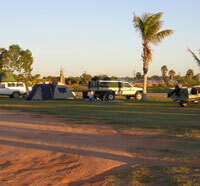 Large grass and paved site suitable for caravans, motorhomes, campervans and tents. Powered with water and sullage. Large grass site suitable for tents only (all caravans, motorhomes and campervans are required to go on powered sites). Close to pools, camp kitchen and laundry. 1. If We agree to change Your booking at Your request then We will be entitled to charge an administration fee of $30 per booking for such changes. Notice of cancelation more than 28 days prior to check-in will be fully refundable less a $30 administration fee. No refund will be paid for cancellations less than 28 days’ prior to check-in. Cancellations providing more than 60 days’ notice in relation to the scheduled arrival date are fully refundable less a $30 administration fee.Cancellations providing 30 to 60 days’ notice in relation to the scheduled arrival date will result in forfeiture of the first night accommodation cost. Cancellations inside 30 days of the scheduled arrival date will result in forfeiture of all monies paid. Mid season: Notice of cancellation more than 14 days prior to check-in will be fully refunded less a $30 administration fee.No refund will be paid for cancellations less than 14 days prior to check-in. Low Season: Notice of cancellation more than 24 hours prior to check in will be fully refunded less a $30 administration fee. No refund will be paid for cancellations less than 24 hours before check-in. Long Weekends and Special Events: Booking of minimum three nights taken until one month prior to the long weekend or special event. Note: Accommodation discounts are not valid for bookings made online. 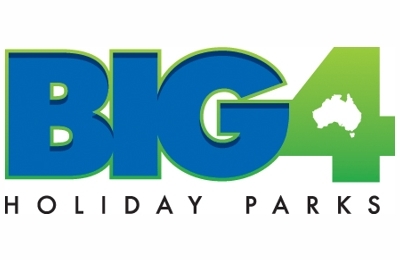 Includes: RAC Discounts BIG4 & Top Tourist.